Please note that we do not sell to Italy due to their inefficient postage system. Acne is characterised by hyper-seborrhoea (excess sebum production) and hyper-keratinosis (excess build up of skin cells on the surface). The excess oil and dead skin cells combine to form a thick paste which builds up in the follicles. This paste will either harden and turn black forming a blackhead or acne causing bacteria will colonise the congested follicle triggering an inflammatory response (whitehead or acne spot). We have combined two of the most effective acne treatment ingredients into a light oil free toner to effectively treat and prevent acne breakouts. We strongly recommend that that you also use our “200ml Nourishing Clay Mask” on an alternate day to a Salicylic acid peel. If you decide not to use an acid peel then people with acne please use our “200ml Purifying Clay Mask”. Phone or email for advice if needed. The Clay Mask link is above. 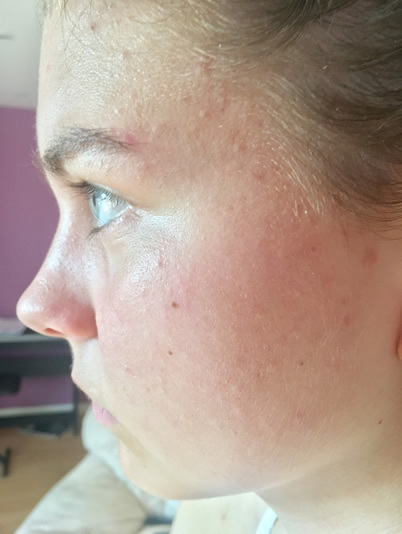 This customer used suffered from acne and blemishes for two years before starting treatment. She used an acid peel once a week, 5% Salicylic once a day and a clay mask twice a week. Blemishes gone and acne greatly improved. Acne-Clear. 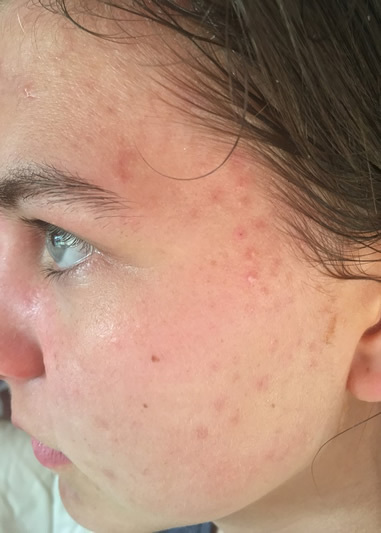 Acne Treatment Spot Prevention and Control. Acnet - is a patented ingredient that targets hyper-seborrhea, and hyper-keratinosis. Acnet also includes a potent anti-inflammatory to soothe inflamed skin. At a 3% concentration ACNET will sterilise 100% of the Propionibacterium acnes (the bacteria responsible for acne). At a 3% concentration Acnet reduces hyperkeratinisation by 54% and hyper seborrhea by a similar amount. Our serum contains a 4% concentration. Niacinamide -universally regarded as an effective acne treatment. In a study 82% of subjects with inflammatory acne showed an overall improvement after 8 weeks of usage of a 4% gel, accompanied by significant reductions in papules/pustules (whiteheads) (-60%) and acne severity (-52%). The active ingredients are supplied in an orange water, witch hazel, and glycerine solution. The orange water is mildly astringent to cut through the oil in the skin, the witch hazel soothes inflammation in the skin and, as it is mildly anti-septic, will further reduce infection. Directions: Apply to clean dry skin. Dampen a cotton pad with the solution and work over the complexion by rubbing in small circles, do not rinse off . Ideally use Acne-Clear every day after two weeks of daily use of our 5% Salicylic Pour Cleansing Solution to maintain the results of the 5% solution. Ingredients: Butylene Glycol, PEG-60 Almond Glycerides, Caprylyl Glycol, Nordihydrogualeritic Acid, Oleanolic Acid, Niacinamide, Papaya leaf extract, Meadowsweet extract, Burdock root extract, Lemongrass leaf extract, Water, Orange Water, Glycerine, Witch Hazel extract, Sodium Benzoate, Potassium Sorbate, Hydroxyethyl cellulose, Citric Acid. 30ml 20% Salicylic Peel, 65ml Neutralising Gel and cotton pads for peel application, for oily, combination and/or acne prone skin. Please note : Salicylic acid peels are not recommended for use during pregnancy or if lactating. Do not use on broken skin or areas affected by eczema, psoriasis or dermatitis. Do not use salicylic acid if you have intolerance to aspirin Not to be used by those with diabetes mellitus or Reynaud's disease. Ingredients: Peel: Salicylic Acid, Isopropyl Alcohol, Propylene Glycol, Glycerine, Triethanolamine. Neutraliser Gel: Water, Panthenol, Allantoin, Hydroxyethyl Cellulose, Sodium Hydroxide, EDTA. "Skin Kits Discounted" page. More adviice on removing Acne, blemishes and blackheads can be found in the same link. 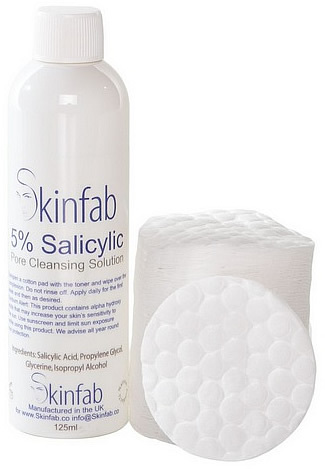 125ml 5% Salicylic Pour Cleansing Solution for daily use. Ideal for oily, combination, and acne prone skin and used as a skin toner. Exfoliates dead skin cells from the surface leaving the skin softer, smoother, and brighter. Encourages skin cell turnover and boosts collagen production. Controls excess oil production decongests the pores. Reducing the possibility of spots and removes blackheads. Directions: Apply to clean dry skin. Dampen a cotton pad with the solution and work over the complexion by rubbing in small circles. There is no need to neutralise the 5% solution nor is it necessary to rinse the skin, as it is self-neutralising. Use once per day for two weeks or until your skin is free of congested pores. If you feel your skin is becoming too dry then use on alternate days and any of our natural moisturisers. Once you feel the pores are clear, use once per week to maintain the clarity of the pores. Ideally also use our Acne-Clear each day after the first two weeks of using this 5% Stoution to maintain the reduced oil production and assist in keeping the pores free of congestion. Ingredients: Salicylic Acid, Isopropyl Alcohol, Propylene Glycol, Glycerine.